AIM toothpaste came out in 1975, one of the first new toothpastes I remember coming out in my lifetime. And I thought it was so cool. It apparently had a milder taste and so they talked up that kids liked it. Wikipedia says "In stores in the U.S., Aim is typically priced at a significant discount to the major toothpaste brands." Never knew that! 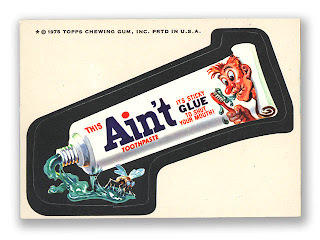 But I remember the "Take AIM against cavities"
Aquafresh actually beat AIM to the punch, coming out in 1973. And it had the coolest gimmick, what with the stripes. They originally were blue and white, but now are red, white and blue. The Crest Cavity Creeps! "We make holes in teeth! We make holes in teeth!"